In Illinois, you can buy a car from a private seller or a dealer. When buying the car from a dealer, they will handle the required paperwork on your behalf. But when you buy it from a private seller, you will need to handle the required paperwork yourself. So, you need the required paperwork from the seller in order to get the car registered and titled with the Illinois Office of the Secretary of State (SOS). Continue reading this article to get more information about the paperwork required when buying a car in Illinois. The vehicle title certificate (which must include your name, signature and address), the seller’s signature, vehicle purchase price and date and odometer reading. A bill of sale, if there is no odometer reading and purchase price at the back of the title. The appropriate tax form, available from Secretary of State offices: If you purchase the vehicle from a private seller, you need to submit Form RUT-50 (Private Party Vehicle Tax Transaction). If you buy a vehicle from an out-of-state dealer, you will need to submit Form RUT-25 (Vehicle Use Tax Transaction Return). 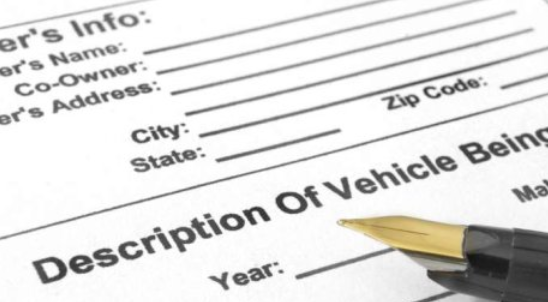 If you buy a vehicle from an Illinois dealer, they will process all the required forms in your behalf. If the vehicle title is lost or missing, the seller must apply for a duplicate copy before selling the car to you. You need a title in your file as it serves as the proof of vehicle ownership if questions arise challenging the legality of ownership. Completed at an Illinois Secretary of State office. Completed and printed through the Illinois Secretary of State ERT system. The vehicle title completed and signed. Payment for fees and taxes: $95 for the title. $101 passenger vehicle registration fee. Sales tax and use tax. Once you submit all of the required paperwork and fees, you will be issued with a new license plate for your vehicle. Any applicable sales tax or use tax. Damage from accidents, floods etc. Odometer fraud is common in Illinois. Many sellers tamper with the vehicle’s odometer reading to make the vehicle appear as if it has covered fewer miles. To avoid becoming a victim of odometer fraud, hire a qualified technician to inspect the vehicle before purchase. You can also get the correct odometer reading of the vehicle you want to purchase in a vehicle history report. Also make sure the seller’s identification documents match the name on the title certificate. Review the odometer reading on the vehicle’s title.